First off, there’s a little seasonal Meme, courtesy of Robin! 1. Take a picture of your favorite ornament and put it on your blog telling everyone about it. 2. 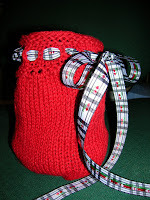 Post a link to the person on whose blog you found out about the Ornament Tag. My favorite for this year is the star ornament Michelle and her Littles made for me. 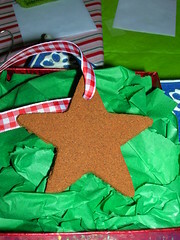 Stars are my favorite seasonal decoration, and how could I fail to treasure such a special star from precious hands? I still have some of the ornaments my aunt and cousins made years and years ago, although they aren’t on our wee tree this year. 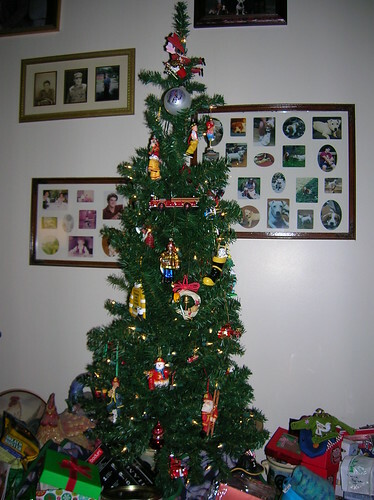 While I love elegant trees with color themed, fancy decorations, what means the most to me are the memories wrapped around my ornaments, many of which are from my childhood. My father’s sister gave me an ornament every years into my 20s, and my mother has passed along some of my paternal grandmother’s ornaments as well, so this star will become another treasure that I’ll hold for a moment and think about Michelle and her family as I place it on the tree in years to come. Speaking of goodies… Friday night found a stack of packages on the porch, and two more came on Saturday. 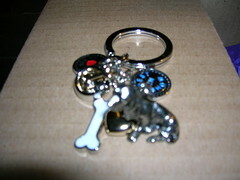 On Friday, Mugsy’s prize pack from Nichole of Lapdog Creations arrived, with goodness all around. The sweet ball had to be photographed separately, as the Knight was opening the boxes for me, and Mugsy was in his lap. Of course, the prince spotted the ball, and it was game on. 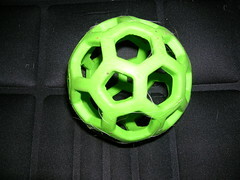 Sissy likes it too, as there’s a bigger version of the ball at the office, but she can play with this one! Thanks Nichole, and The Princess(donated the doggy prizes)! There are also bones, both dentibones and some special cookies, made by Nichole, from her furkids to mine, and both are current favorites here. For me, there was a very special present from Nichole. Now, keep in mind that when she bought this, when Mugsy won his prize, and even when she shipped the package, Sissy wasn’t a part of our household. Amazing, eh? She didn’t know I desperately needed a keyring for the new key to the Lexus. (The 4Runner’s remote WAS the keyring I used, but the Lexus’s remote is built into the key. Handy, but hard to find in a handbag!) It’s a craptastic photo, but that silver wad in the right corner is a basset hound! Now, Fred and Sissy Freida will always be on hand to help me find my keys. Thanks so much Nichole! Here. We’ll pause for you to go grab another drink, cookie, whatever. Put your nose on the screen and read the sweet words on the candle on the right. Sniff, sniff. Thank you, Mary. You are truly a Godsend! 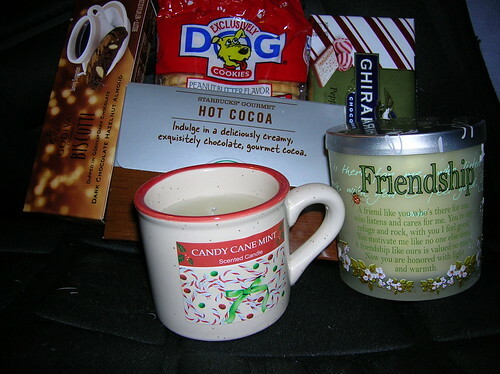 There were also some sweets, some cocoa mix which the Knight has already claimed, and some dog cookies for the furkids! Saturday’s post brought two surprises. 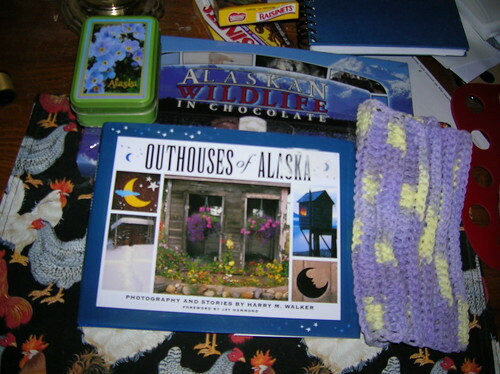 The Knight quickly opened a pretty padded envelope from Alaska, from Ingrid. We were so honored and blessed to not only meet Anne’s mom, but we got to spend several days with them. Clearly, she got to know us too, because her package was filled with perfection! Don’t mind my roosters in the background, or the Raisinettes. (I’m pretty sure the top box is empty, but I’ve been told to keep my paws off!) There’s a pretty cloth, which the Knight has claimed (see a theme here? ), a box of chocolates which is big enough to share, a fun book which the Knight – not a big reader – has already read, and pretty tin of playing cards. Fortuitous that, as the deck of cards in the pocket behind the driver’s seat on the 4Runner didn’t make it into the box from the salvage job the Knight and a co-worker did. You might think that without the Page around, we wouldn’t need quick, easy entertainment. Wrong. The Knight is a card-counting card shark, and we both love to play Spades, Hearts, Rummy, Gin, and when we have several decks and some clever friends, Hand and Foot is great fun! Thank you so much Ingrid, for gracing our home and for your delightful gifts! 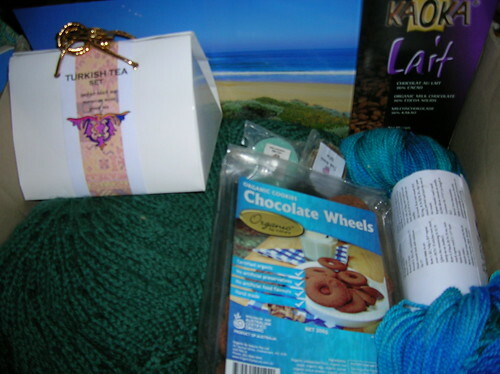 Now, you can’t see all of anything in the photo, but there’s a lovely lap blanket on the left, chocolate and more chocoate, yarn (details to follow), tea, great-smelling wax tarts, and a beautiful calendar filled with Autralian Beaches. The yarn’s not so electric, but in case you couldn’t tell, the overcast days and indoor lighting aren’t providing the best shots. My first Fleece Artist, all the way from the other side of the world! There’s a sock pattern on the label too! The colors remind me of the water in the above mentioned calendar. 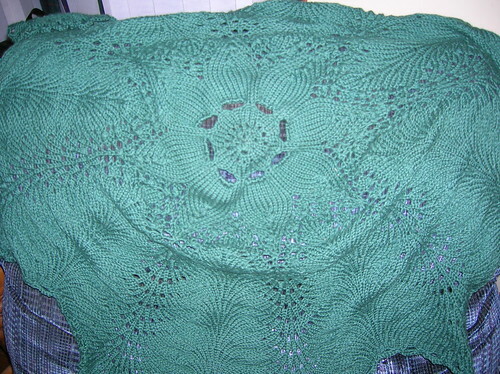 I had the devil of a time trying to photograph this lovely shawl. Mugsy insists it is a lap blanket, perfectly designed for my lap and enough overlap for him. Sissy won’t be allowed near it until her baby teeth move on. The color is pretty accurate in this photo, even if the Knight’s recliner doesn’t show it off so well. I am in awe! It means so much that you invested all of this time in a gift for me, Sue. Thank you, thank you, and thanks to Latte for such a generous gift. I think that about does it for this update. I hope all of you are off tomorrow and enjoying time with friends and/or family. We’ll work for a couple of hours tomorrow, and go back to work on Wednesday. From our house to yours, we wish you a very merry Christmas! Firstly, Mugsy, the Knight and I wish to thank each and every one of you for your sympathy and support. The Knight is working on his own memorial for his hound, and I think that when it is complete, I’ll share more with you about the life and times of Sir Fred Aloysius, and all of his other aliases. Because it’s coming up in face to face conversations, let me politely but firmly state that no, we won’t be getting another dog any time soon. Fred was the Knight’s dog, and he doesn’t want another at this point, and that’s all that matters. 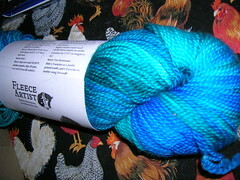 Thursday, much knitterly goodness came my way, and all I was able to do was note its arrival. I heartily apologize to Nannette and my SP11 pal, as it was in no way a reflection upon their thoughtful, “perfect fit” packages. In fact, the timing of the arrivals was perfect; it gave me a bit of a distraction during an otherwise awful time of waiting and wondering. My secret pal sent this book, which is curious, because perhaps only Devon and maybe Ana know how very much I’ve wanted this book. It’s actually still in my “stash” at Knitpicks and on my Amazon wish list, but I’ll fix both of those tomorrow, or that’s the plan anyway. Mugsy and I looked at all the socks, but the truth is, I want to make all but maybe one or two of the patterns in there! Thank you again, secret pal! The garden flag is already flying, and you’ll likely see it in other photos in the days and weeks to come. I needed a new flag for out on the back deck, and had purchased several (school fundraisers – I am a sucker), but hadn’t gotten around to putting one in place. The cheery colors are just what the doctor ordered! Mugsy and I will think of Nannette and all of the great swappers from the tea swap while we sit on the deck and have tea on pretty fall afternoons. We’ll probably be reading the book too. 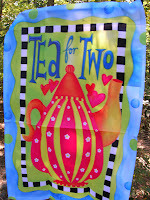 I just discovered Debbie Macomber and knitting fiction, and now I learn there’s tea fiction too! The knitted coasters are perfect too. They are in a colorway I have picked up a couple of times but always put back, as I have so much cotton and knit so few dishcloths. Note how Nannette even went to the trouble of making a little twisted cord to hold them all together! (Hey Shawnee! Won’t “our” tea for one cup be beautiful on this?!) You can’t really tell here, but the colorway is a great, soft blue and green, with white. They are so pretty, and will help me feel pampered while I sip my tea. As above, I don’t believe I’ve blogged or even mentioned to my nearest and dearest that I’ve had this sushi knit in my shopping cart more than once too. I look forward to deciding which pattern I’ll follow – or be a renegade and do my own thing? (not likely) – and to adding zipper abilities to my finishing skills. For the record, I do not like sushi, but I do love these colors. I went through a raw oysters and beer phase early in my adulthood, but that was a long time ago, and with the exception of a good steak, I like my meat COOKED. Last, but hardly least, here’s Mugsy inspecting his tea treat. He really appreciates being included, especially since his mourning mother failed to buy him a toy for his birthday. He did get his special meal though – two nights in a row, since I already had planned for it to be shared – and his big treat came tonight, when the Knight FINALLY allowed Mugsy to ride in his “new” truck. I suspect that we are well on our way to becoming the weirdos our friends talk about, because we take our dog everywhere, appropriately so or not. I’m not quite old enough to be a crazy old lady, but evidently, I’m mature enough to thumb my nose at convention and do it my way. Again, we thank you for all of your emails, comments, etc. Even if I failed to reply personally, please know that we read each and every one, and it helped bolster us. 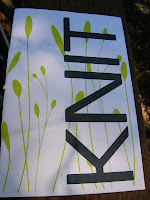 I’ve only been knitting since late November, 2006. I first learned about 25 years ago, but I refreshed my memory after a visit from dear Anne. I couldn’t have done it without knittinghelp.com and her video clips. I still bug Anne, Devon and Martina with questions! I would say I’m an intermediate with a strong sense of adventure, meaning that if I want to try a pattern, I will, regardless of the skill rating. I do have an Amazon list, and since this question keeps coming up, I’ll add the button to the sidebar. I do. I love chocolate and peppermint. I do not spin. I used to cross stitch and needlepoint. Currently, I scrapbook and stamp, or at least, talk about them while knitting. I like all kinds of music. I love musicals and big band, country, rock, classic rock, gospel, classical music, beach music… Any format will work! Greens, reds, pinks and blues are always safe. I adore rich, medium to dark browns too. I cannot stand strong yellows and orange. I am married to my Knitter’s Knight and we have two aging, wonderful dogs. Yes to all, but I’m rather maxed out on scarves. Socks. Dishcloths. Whatever strikes my fancy. Did I mention socks? Socks. However, I’m also getting ready to knit another dishcloth, a baby item or two, and who knows what else! Yes? I love my circs. I do use Bryspun straights for dishcloths, and both dpns and circs for socks. Metal, metal, METAL. I don’t care to ever see bamboo or plastic needles again. Um… Don’t have a SINGLE one! 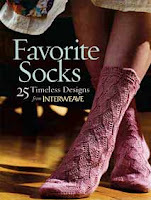 Currently, I subscribe to Creative Knitting, and I intend to subscribe to Interweave Knits. Unfortunately, anything I’m dying to have, I’ll buy before a pal could! Cables, but that is likely to be my next project. Lace. Crochet. I am a sock knitter. No knee socks, please! (Short, stubby legs, you see…) Circumference: 8.5 inches, length: 9 inches (give or take). I wear a 6.5 or 7 in US sizes. I’m one of the millions still waiting for my invite.